Grain d'argent de la Monnaie royale canadienne de 500 onces Have your own form-able silver when you purchase a 500 oz Royal Canadian Mint Silver Grain sealed security bag today. Get silver in it's purest form - shots of 999 grain in a Royal Canadian Mint verified and sealed inside a thick plastic security bag. 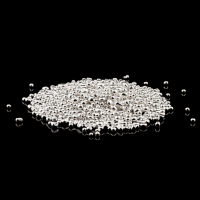 Silver grain is used to manufacture items such as jewelry and other hand crafted items.